One of my favorite things about staying in Meerut, India, was that I could explore it by bicycle. You might remember my post about my shiny new, ultra-durable and practical bicycle a few weeks back. Friends of mine will know that when I have two wheels under me, there's bound to be a customization hack in some form or another. For my jaunts around town I knew I'd definitely need some tunes, and I'm not the type to keep them to myself! The (hard to see) speakers on the back bikerack worked wonders and I was getting smiles all over town when I pumped my party playlist (anything from Jamiroquai's Virtual Insanity to Armstrong's Stompin' at the Savoy). 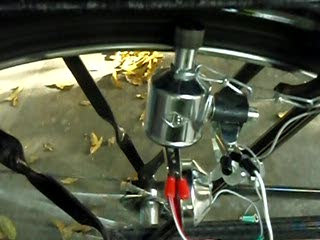 The computer speakers are directly powered by the dynamo (generator) on the side of the cycle. More on this later. One side-effect of this no-battery setup that I actually really like is that when I stop completely, I have about 2 seconds of fading music. Starting up, the volume naturally has a nice ramp up so it isn't annoyingly loud at the outset (but it is when moving?!). The above photo has four jacks/plugs facing each other. 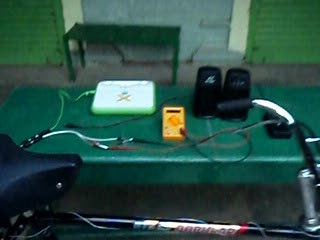 On the left there are two 12 Volt DC power sources: AC to DC wall adapter and clips to AC bicycle dynamo/generator with rectifier circuit. 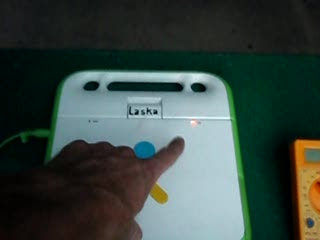 On the right there are two power sinks: OLPC laptop and computer speakers / audio player. Using just RCA jacks was very convenient, as a splitter (not shown) could be used with the extra jack going to a multimeter for live voltage monitoring. Same devices in the 'lab' (secret code for the front yard). The "alternative" source of power (compared with the AC adapter that plugs in the wall): a bottle dynamo for a bicycle. This is actually a generator that produces AC power, normally used to power a front and rear light. I think it's a fantastic, low cost, readily available power source in third world countries. My time in India would not be complete without some sort of work outsourcing, and so I embraced globalization (well, down-the-street-ization) and had the resident engineer at Rajni Radio design the solutions to my problems. It was an iterative process, to say the least. :-) And I can definitely attest to the notion that labor is cheap in India as a result of my outsourcing! Dude that rocks! You finally hooked up your system! I'm very proud of you. I would love to see a video of you cruisin' around with the tunes blastin'! Nice work - bike still lookin' great.